Drawing, William Goyens by Neil Caldwell. Courtesy of the Naylor Company. Image available on the Internet and included in accordance with Title 17 U.S.C. Section 107. GOYENS, WILLIAM (1794–1856). 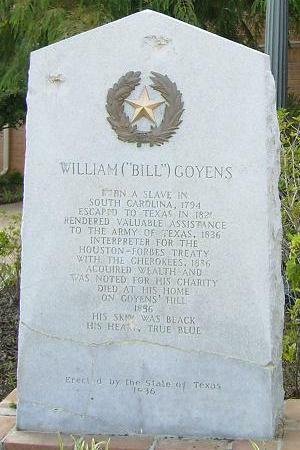 William Goyens (or Goings), early Nacogdoches settler and businessman, was born in Moore County, North Carolina, in 1794, the son of William Goings, a free mulatto, and a white woman. He came to Galveston, Texas, in 1820 and lived at Nacogdoches for the rest of his life. Although he could not write much beyond his signature, he was a good businessman. He was a blacksmith and wagonmaker and engaged in hauling freight from Natchitoches, Louisiana. On a trip to Louisiana in 1826, he was seized by William English, who sought to sell him into slavery. In return for his liberty, Goyens was induced to deliver to English his slave woman and to sign a note agreeing to peonage for himself, though reserving the right to trade on his own behalf. After his return to Nacogdoches, he successfully filed suit for annulment of these obligations. During the Mexican Texas era, Goyens often served as conciliator in the settlement of lawsuits under the Mexican laws. He was appointed as agent to deal with the Cherokees, and on numerous occasions he negotiated treaties with the Comanches and other Indians, for he was trusted not only by them but also by the Mexicans and Anglo-Americans in East Texas. He also operated an inn in connection with his home near the site of what is now the courthouse in Nacogdoches. In 1832 he married Mary Pate Sibley, who was white. Sibley had one son, Henry Sibley, by a former marriage, but Goyens and Mary had no children. William Goyens plaque. Image available on the Internet and included in accordance with Title 17 U.S.C. Section 107. William Goyens historical marker. Courtesy of Sarah Reveley Photography. Image available on the Internet and included in accordance with Title 17 U.S.C. Section 107. During the Texas Revolution, Goyens was given the important task of keeping the Cherokees friendly with the Texans, and he was interpreter with Gen. Sam Houston and his party in negotiating a treaty. After the revolution he purchased what was afterwards known as Goyens' Hill, four miles west of Nacogdoches. By 1841 his property included 4,160 acres of farmland, several town lots, and nine slaves. He built a large two-story mansion with a sawmill and gristmill west of his home on Moral Creek, where he and his wife lived until their deaths. During his later life Goyens amassed considerable wealth in real estate, despite constant efforts by his white neighbors to take away what he was accumulating. He always employed the best lawyers in Nacogdoches, including Thomas J. Rusk and Charles S. Taylor, to defend him and was generally successful in his litigation. By 1856, Goyens owned 12,423 acres of land, including 4,428 acres in Angelina County. He died on June 20, 1856, soon after the death of his wife; they were both buried in a Nacodoches County cemetery near the junction of Aylitos Creek with the Moral. At his grave a marker was erected by the Texas Centennial Commission in 1936. Many traditions grew up in Nacogdoches about this unusual man, and sometimes it is hard to tell just what is true and what is tradition. Daniel James Kubiak, Monument to a Black Man (San Antonio: Naylor Company, 1972); A.C. Greene, Sketches from the Five States of Texas (College Station: Texas A&M University Press, 1998); Gary Clayton Anderson, The Conquest of Texas: Ethnic Cleansing in the Promised Land, 1820-1875 (Norman: University of Oklahoma Press, 2005); Bexar Archives, Dolph Briscoe Center for American History, University of Texas at Austin. Robert Bruce Blake Research Collection, Steen Library, Stephen F. Austin State University; Dolph Briscoe Center for American History, University of Texas at Austin; Texas State Archives, Austin; Houston Public Library, Houston. Nacogdoches Archives, Steen Library, Stephen F. Austin State University; Dolph Briscoe Center for American History, University of Texas at Austin; Texas State Archives, Austin. Handbook of Texas Online, R. B. Blake, "GOYENS, WILLIAM," accessed April 18, 2019, http://www.tshaonline.org/handbook/online/articles/fgo24. Uploaded on June 15, 2010. Modified on April 27, 2016. Published by the Texas State Historical Association.